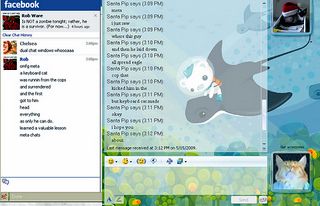 Instant messaging etiquette is all about how your use this online tool without being abrasive or offending others. We have put together the following tips to maximize your effectiveness while using instant messaging. Be careful what you write - Instant messaging programs have the capability of saving conversations and people can copy and paste the text very easily. As a result, you should never type something that you would not want the world to see. If you put something very rude or very personal on there, there is a good chance that will end up somewhere where you do not want it to end up. Ask about availability - Since you cannot see if the other person is busy or not, it is good instant messaging etiquette to ask if the other person is busy or if they have time to chat. Otherwise, you may be bothering them while they are trying to get something else completed. Change your status appropriately - If you are going to be away from your computer, or you are working on something at the moment, or you simply do not want to chat with other people, change your status to show that. There have been times when I have seen people log on to instant messenger or to Facebook that I did not want to chat with. I changed my status to offline or busy so that I would not have to talk to them. Keep it brief - This type of communication is intended for brief, quick messages. You should not have a full conversation and type out paragraphs at a time. If you have that much to say, you should either pick up the phone and call, or you should switch to email. Keep it simple too - There are people that try to manage multiple instant message conversations at the same time, or they are trying to go so fast that they abbreviate everything. You should simplify your conversation when using instant messenger. Your friends should not have to try and decipher the hidden message in your abbreviations. I hope this helps with your instant messaging etiquette. Your friends will appreciate the extra care you take to communicate with them.